What is the process for volunteering? Team Leaders will follow up with training instructions by email and in groups the week of the festival. Ask 100 volunteers and you may get 100 different answers. Volunteers receive a full-festival pass, camping, parking, t-shirt, and breakfast. Use your skills and talents to help make the festival come alive for everyone. Try something new and discover things you didn’t know you would enjoy. It’s a great conversation starter in interviews. Put it on your resume. Sometimes it’s hard (because it’s hot, or it rains, or…) and hard can be good because sometimes it can help us to grow. Make friends you can stay in touch with, encourage, support, post cat videos…or crash on their couch when you travel across the country. How many volunteers do you accept? Each year the number of volunteers increases with the growing festival…180, 225, 260. Many hands make light(er) work, so we really do need volunteers to are willing to commit to the values that keep our community safe and fun to work and play together. We anticipate that more people will apply than we can accept, and even if you are accepted we are not able to guarantee a match that fits each person’s schedule or preferences, but if you are flexible, we will certainly try our best to you plug in. What if I’ve never been to the Wild Goose Festival…should I volunteer? 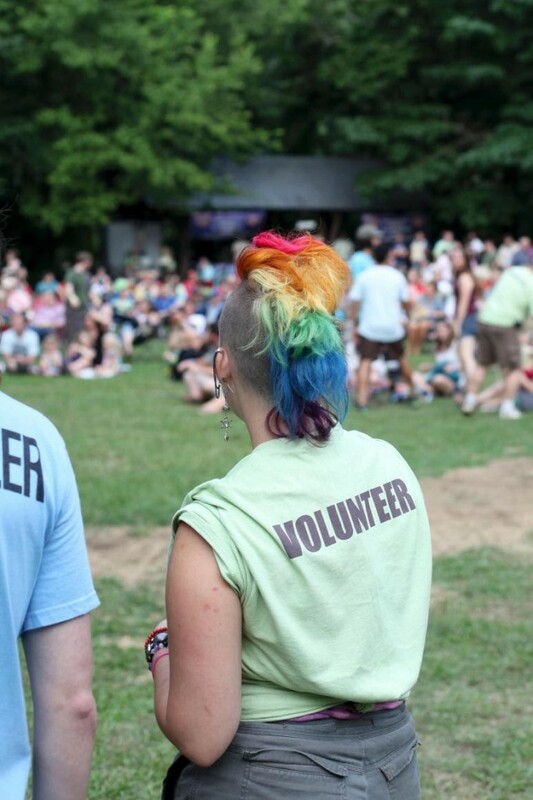 Volunteering is a unique way to experience the festival. It can be a great way for first-time participants to jump in with both feet and plug into the festival community. An advantage of being a volunteer is that you will automatically get to know a smaller group of people by seeing them every day or working closely with them. Plus, volunteers often are interacting with other festival participants so they connect with many stories, get feedback about how the sessions are received, glean highlights and go deeper in conversation. Volunteers may not get to attend every session; however, they usually say the volunteering was the highlight of their weekend. Some teams have age requirements of 18 and older. We also have several teams for 16 and 17 year olds with Parental Consent. We love having responsible, enthusiastic, hard-working young adults jump in. They often say volunteering was their favorite part of the festival because they met people and they felt a part of the big picture. How do parents with children volunteer? Sign up for pre-festival or post-festival shifts. This may provide more flexibility for your childcare options. Sign up to work in the kids programs. This way your schedule will be mostly concurrent with your child’s schedule. If you and your co-parent both sign up as volunteers, sign up for different schedules in order to alternate child-care. Sign up to volunteer and communicate with your Team Leader about the possibility of splitting the shifts with a co-parent/friend/family. Can I schedule my volunteering around all the sessions I want to go to? Great news is that you will have the freedom to schedule your 16 hours of team service. Unfortunately, the program schedule will not be finalized until much closer to June. You can work with your other team members and Team Leader to switch shifts where possible.